The Radiant of the Perseid Meteor Shower. Over the night of August 12th, into the 13th.,we have the maximum of perhaps the greatest ‘shower’ of shooting stars in the whole year; ‘The Tears of St Lawrence’, known astronomically as the ‘Perseids’. 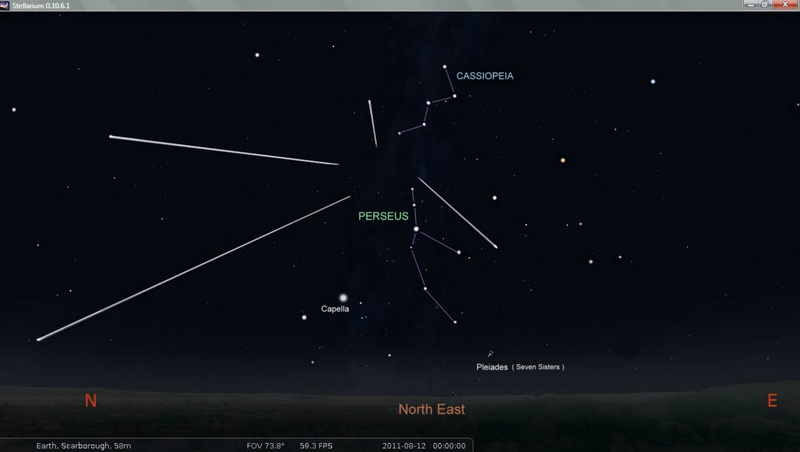 The Perseid season starts in late July and continues to well past the middle of August. The maximum and best time to view the meteors is coming up as we approach that date. Sky watchers outdoors at the right time, and for the nights just before and immediately after the night of 12th/13th may see occasional outbursts, and almost always, long hours of gracefully streaking meteors. The alternative and poetic name “the Tears of St Lawrence” originated following the martyrdom of that saint on August 10th in the year 258 AD, in Rome. The early Christian Church was being persecuted at the time, by order of the Emperor Valerian, and its leaders arrested and put to death. The churches were looted for their treasures to fill the emperor’s coffers to pay his soldiers. Lawrence was a Christian deacon in one of Rome’s churches, and was arrested. The Prefect ordered him to go back to his church for the valuables and to return with them straight away. Lawrence however, gathered together the poor people of his ‘parish’ and brought them to the prefect saying, “These people are what the Church values most!”. Obviously, the Prefect was not amused, and ordered that Lawrence should be burned to death on a gridiron. After he had been martyred in this rather barbaric way, his followers saw the Perseid shooting stars during the following nights. They believed them to be from Lawrence, who was shedding tears in Heaven for the persecution and suffering that the early Christians were undergoing at the time. Scalby parish church is dedicated to St. Lawrence, and scenes from his life and martyrdom are depicted in the east window above the high altar. The source of the shower is Comet Swift-Tuttle, a dirty snowball, 17 miles in diameter that crosses the Earth’s path every 133.25 years. Although this comet is nowhere near Earth at the present moment, the debris from the comet’s wide tail does intersect Earth's orbit around now. We pass through it each year in July and August, and tiny bits of comet dust hit Earth's atmosphere travelling at 132,000 mph. At that speed, even a tiny speck of dust makes a vivid streak of light when it disintegrates, resulting in a bright shooting star, which we can see. The shower is most intense as Earth passes through the dustiest part of the comet’s path, and this happens at 07h UT on the 13th.The Moon may interfere this year as it is waxing and gibbous and may prevent the observing of fainter Perseids. Perseid meteors seem to radiate from the direction of the constellation of Perseus, named after the Greek hero who severed the fearsome head of Medusa the Gorgon, hence their name. The best time to watch is from the late evening on Friday 12th, and as the night progresses, shooting star numbers increase as the constellation of Perseus climbs higher in the eastern sky. Most meteors will be seen during the hours before sunrise, when Perseus is high in the sky, between 2 a.m. and dawn on Sunday, August 13th. Make sure you are in the darkest part of your garden, well away from street lights. Then you may see up to 80 meteors an hour before dawn. Just get the sun lounger out, lie on it, and look straight up. However, I would advise you to warn the neighbours, otherwise they may begin to worry about the state of your health if by chance they see you lying there at a strange hour! Americans, Lewis Swift and Horace Tuttle, working independently, discovered the comet in 1862. Three years later Giovanni Schiaparelli (of Martian "canali" fame. 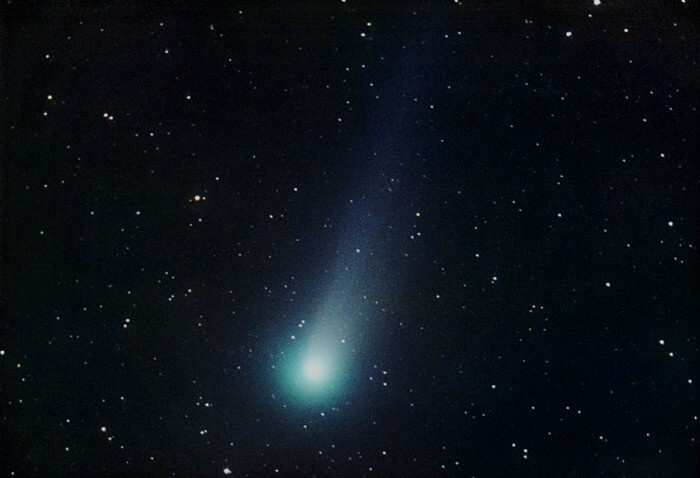 He was the first man to “see” the fictitious “canals”) realized that this comet was the source of the Perseid meteors. He also realised that the comet could come quite close to Earth, but in those days no one worried about such things. The idea that comets and asteroids might threaten our planet was not widely accepted until the 1980s. Then astronomers began to wonder. Comet Swift-Tuttle is big, almost twice as big as the asteroid or comet that wiped out dinosaurs 65 million years ago. In 1992, when the comet made its last crossing of the earth’s orbit, new computer technology, working on observations of the comet’s path and its movements, indicated that the very next time the comet returns, on August 14th in the year 2126, Swift-Tuttle might strike the Earth or Moon. Chances are that this will not happen, due to a number of variables, but the comet will be a spectacular object filling much of the sky. The situation in 4479 however, could be very different, when the comet is predicted to come even nearer on September 15th in that year! 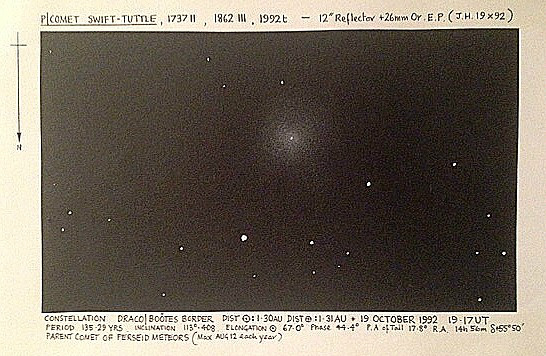 So the question is; does comet Swift – Tuttle have the Earth name written all over it? But for now, relax in your sun lounger, and. enjoy the show - weather permitting, as always!. It is estimated that about 50,000 tons of meteorites reach Earth’s surface each year. That might seem high, but the vast majority of this figure is made up of micrometeorites, dust-sized specks from 50 µm to 2 mm in diameter. 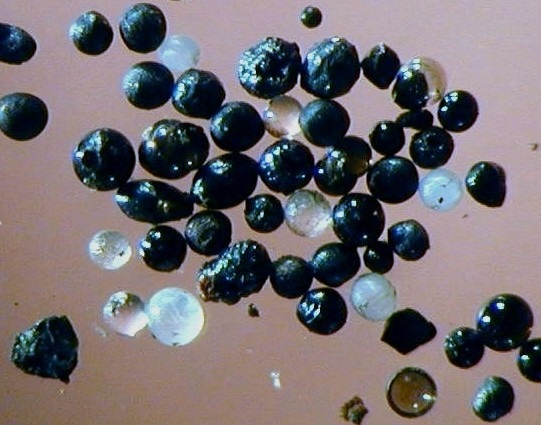 It is estimated that about one micrometeorite lands every square metre each year. This means that there are many micrometeorites available to collect, if you know how to do it, and have a microscope to see their shapes which are chiefly spherical and their ‘pitted’ reflective metallic surfaces. You need the following: a strong magnet, a slide or glass dish, a clear polythene bag, some muddy water and a small microscope. Simply place the magnet into a clear polythene bag: 'swish' it around in some muddy water. then after shaking away drips from the polythene bag with the magnet still in it, place the bag and magnet into a dish of clear water: remove the magnet and allow the polythene bag to be moved in the water (minus the magnet), where upon any micrometeorites will sink into the fresh water; then either allow the water to evaporate, or put a drop onto a slide and then using the microscope you should be able to detect these mostly spherical objects, made mostly of Nickel-Iron , both magnetic materials, hence the use of a magnet in their recovery.